​Maybe you should try Xooma's new Probiotix™. Do you or someone you know suffer from: Candida, Irritable Bowel Syndrome (IBS), Crohn's Disease, Diverticulitis, Colitis, Leaky Gut Syndrome, Depression and Anxiety, Vitamin and Mineral Deficiencies, or issues from antibiotic overuse? ​Probiotix might be right for you. Who should use a probiotic? If you answer "YES" to any of these questions, you may be a prime candidate to benefit from this new product. Do you take or use antibiotics? Do you consume processed food? Do you consume GMO foods? Do you experience emotional stress? Don’t be fooled by the ‘bargain’ brand probiotic products on the retail store shelf. 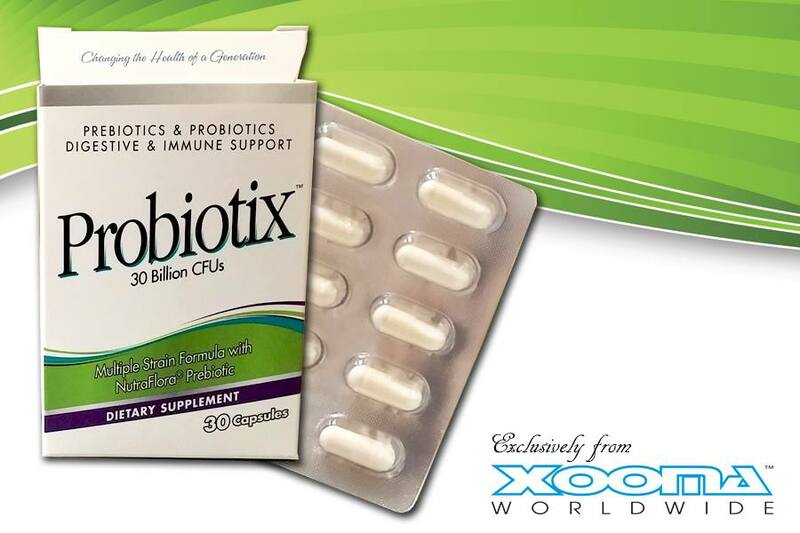 Today’s highly advertised probiotics pale in comparison to Xooma’s NEW Probiotix formula. CFU’s (Colony Forming Units): Xooma’s Probiotix contains 30 Billion per capsule. That’s as much as 30 times more than the competition! Number of Probiotic Strains: More strains = more health benefits. Xooma’s Probiotix contains 8 clinically researched strains while the competitors’ only offer 1, 2 or 3 strains. Prebiotics: Xooma’s Probiotix contains a research proven, trademarked prebiotic formula known as NutraFlora. Sadly, only one of today’s popular retail brands even offers a prebiotic (generic inulin). 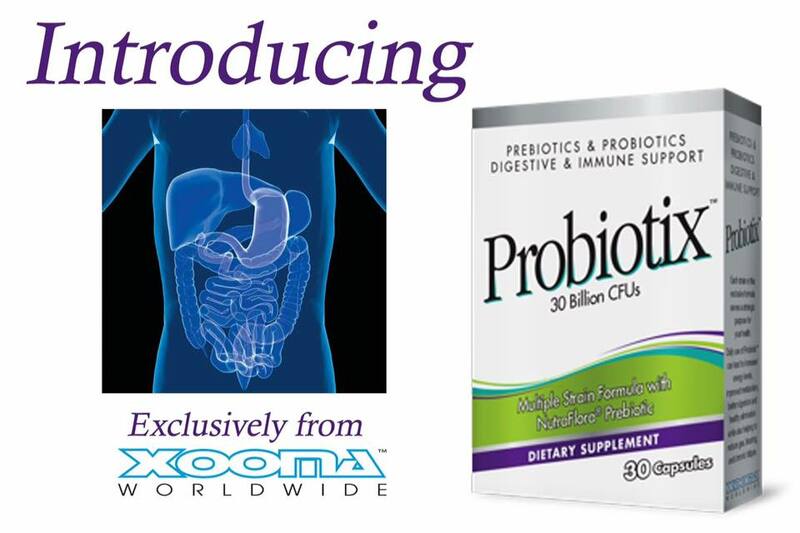 Price/Value: Compared to most retail brands, Xooma’s Probiotix gives you 20 -30 times more CFU’s, 5-7 more probiotic strains and is the only one with a trademarked prebiotic blend. You’d have to buy multiple boxes of the competitive brands just to equal the CFU count of Xooma’s Probiotix. That’s why there’s no better value for your money than Probiotix! Probiotics are quickly becoming a major conversation piece in health and wellness discussions. If you already know about probiotics, then you understand how important they are to good health. If you're not familiar with them, now's your chance! 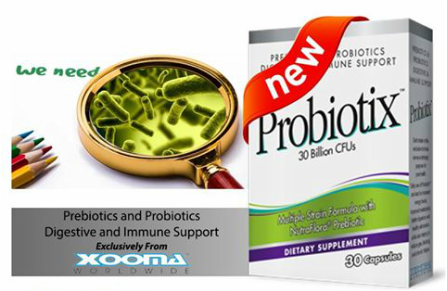 Xooma has been developing another cutting-edge prebiotic and probiotic blended formula. Probiotics consist of live bacteria and yeasts that are good for your health, especially your digestive system. Your body is full of bacteria - both good and not-so-good. Probiotics represent the 'good' or 'helpful' bacteria because they keep your gut healthy. This is especially important to your overall health since modern research is showing that many diseases are linked to gut health. Here's what that means for you. Probiotics can be especially beneficial to anyone who suffers from digestive problems, including gas, bloating, or indigestion. Given the widespread use of chemical additives, processed sugars, and other unhealthy ingredients commonly found in many modern foods, probiotics can be a healthy addition to virtually anyone's diet. 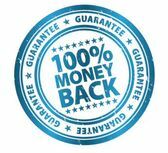 Just like many of our product formulations, Xooma consistently incorporates high quality ingredients, trademarked and patented formulation and offers them at clinically-meaningful dosages, and at great competitive prices making them affordable for our Members. 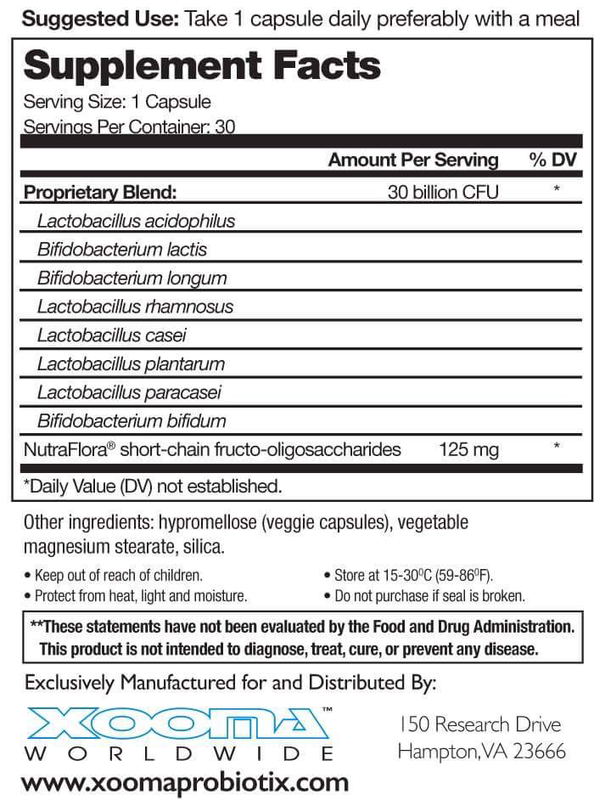 Specific to this product, a high quality probiotic formula should contain prebiotics and probiotics. That's what you can expect from Xooma Probiotix. 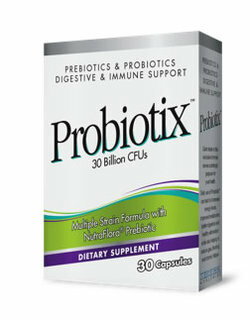 NutraFlora® is a trademarked prebiotic that is contained in our Probiotix formula. In addition to NutraFlora, our formula contains over 30 billion CFUs, or colony-forming units, of beneficial bacteria. Probiotix also includes clinically-meaningful dosages of 8 key strains. How much do you need to take, you ask? Here's the exciting part. You only need one capsule per day, preferably with your first daily meal. Then you're good until the next morning!